The Cooper Medical School of Rowan University (CMSRU) is a new medical school that opened in 2012. CMSRU takes a unique approach to training physicians. In traditional medical school, students spend the first two years in classroom attending lectures, only spending years three and four in clinical training. But CMSRU students attend only six hours of lecture classes each week, giving them more time for clinical training and real-world experience. Providing as much hands-on clinical experience is critical for medical students today. The Association of American Medical Colleges Center for Workforce Studies released a recent survey which found that medical school deans were concerned about clinical training opportunities for students. As enrollment in medical schools continues to grow, schools must identify new clinical training opportunities to keep pace. CMSRU is starting by ensuring that class time is spent engaging with course content and discussing real-world scenarios. The school has developed “active learning rooms”—classrooms where groups of eight students work with two faculty facilitators on clinical problem solving. To support a collaborative and engaging learning environment, CMSRU is deploying Echo360 lecture capture solutions. “Innovative teaching is a key component of our mission,” says Lauren Stutzbach, Instructional Technology Design Assistant at CMSRU. “I work directly with our instructors and faculty to integrate Echo360 and active learning methods in the classroom. We’re very focused on encouraging students to actively participate. One method that has been particularly effective is to add interactive activities into a traditional lecture through Echo360. Instructors will ask questions and students respond right from their laptop or smartphone. It allows students to participate in ways not normally found in traditional lectures,” Stutzback adds. The six hours of weekly lecture material is recorded in Echo360, allowing students to view the lectures as often as they want, on their own, in study groups, or with their faculty facilitators. Lecture capture also enables instructors to flip their classroom by providing lecture content in advance of class, freeing up class time for more interactive activities and team-based projects. In preparation for exams, instructors use the Echo360 platform to make the most of class review time. Instructors quiz students on important concepts through the platform, and display the results in real-time. Class discussion then takes place around the questions stumping students. The ability for students to give feedback and ask questions anonymously also helps instructors teach and discuss sensitive medical ethics issues. The following graph shows the relationship between student activities (note-taking and participation) and grades. 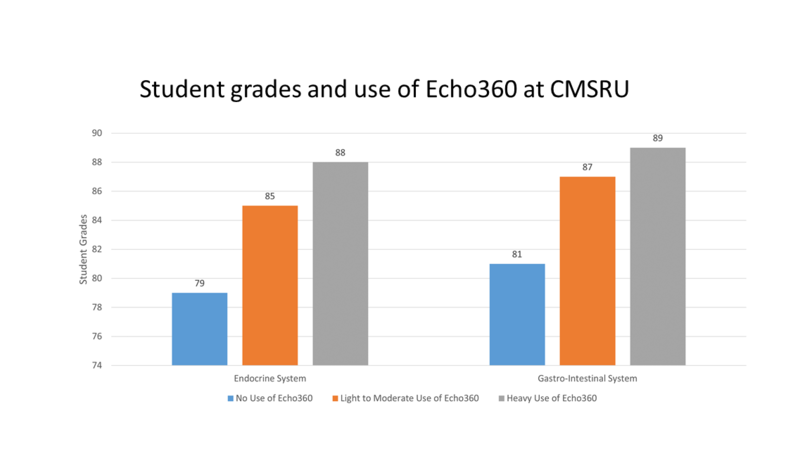 “What we can see is that the students with the highest grades are those who interacted the most within the Echo360 system. The data are very preliminary and we’re working on collecting more. We are working with certain faculty members to put together more thorough research to investigate the effect of student engagement and attendance on outcomes. But the early results are very encouraging to us,” says Stutzbach.